What is happening on the Place de la République in Paris? The fact that the “Musées Debout” (“Museums Awake”) initiative has set up camp in this iconic square is no coincidence. “République” derives from the Latin “res publica” (public thing) and there is definitely a public thing going on here right now. Musées Debout is an offshoot of the “Nuit Debout” (“Night Awake”) movement, which attempts to spark discussion and debate with anyone and everyone unhappy with France’s political life and authorities. The eclectic, vocal protests, hailed by the French media as a duplicate of “Occupy Wall Street” or the Spanish movement “Los Indignados” (The Outraged) pick up steam every night, because there is no shortage of people who are unhappy with the way things are run in France. “Reclaiming” purpose is at the center of Musées Debout, which strives to question the current practices of museums, establishments which have become far too much like the still lives they display. In the eyes of participants, these modern cultural institutions are too settled in their ways and doomed to attract only the same circles of visitors. The fact that that Musées Debout was started by a Louvre curator, whose Velázquez exhibition at the Grand Palais was one of 2015’s most successful Paris art shows, has not eluded the media. Yet, if Guillaume Kientz shines the spotlight on the cultural malaise, he’s not alone in advocating “the return of public debate within museums and the return of museums within public debate.” Bernard Hasquenoph, author and founder of Louvrepourtous.fr, and Alexandre Curnier, publisher and editor of the beautiful, free and very literary Noto magazine have also joined the effort. A few days each week, they sit down with art history students, museum staff, artists, guides, amateurs of every stripe or curious passers-by to exchange views on the importance of the museum in our cultural society, the challenges it faces and problems it poses. So far, talks have encompassed discussions as wide-ranging as the place of the museum in today’s landscape, the relationship with heritage, or contemporary art. Last Sunday, Musée Dehors, an open-air museum, was set up on the Place de la République. 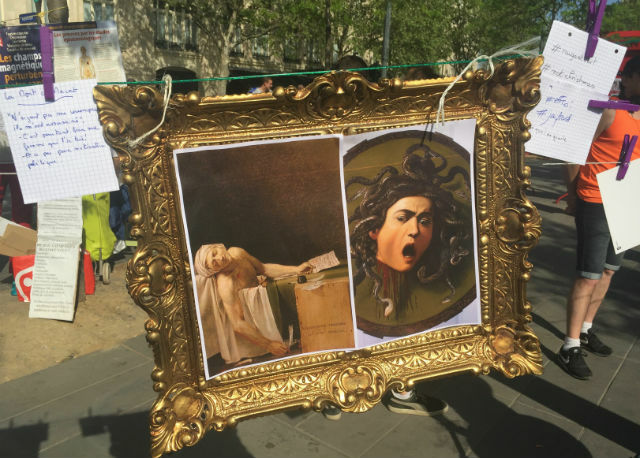 Roughly printed reproductions of various artworks were placed in gilded frames and hung on strings attached to street lamps and trees, as if on a washing line. The scene was reminiscent of some paintings by 18th-century artist Hubert Robert —currently the subject of a retrospective at the Louvre — who depicted grand Italian ruins being reclaimed by locals captured in their everyday chores. Several volunteers, curators, art history students and guides chose a particular piece (drawings, engravings and sculptures were also displayed) and reached out to bystanders, offering information, trivia, but also engaging in thought-provoking discussions. In spite of the cold, the on-and-off downpour and the first few moments of hesitation, a dialogue was established with curious onlookers. Alexis Dussais holds guided tours in French sign language. A student at the École du Louvre, he joined the event and reminded his audience of the need for more accessibility in public institutions as well as the importance for disabled and non-disabled to mingle. Thanks to a sign language interpreter, everyone was able to benefit from Alexis’s fascinating tale of Leonardo da Vinci’s attempt to include deaf people in 16th century society. In “Virgin of the Rocks”, one of the paintings he commented on, the gesture of Mary can be regarded as the synthesis of the letters L and D, the master’s initials. In just three hours, the outdoor museum has somehow outed art, forcing it outside of its stern walls and intimidating boundaries. It will be set up again next Sunday, with English-speaking interpreters. Meanwhile, Musées Debout will resume its weekly debates, hoping to shake the dust off museums, awaken their rightful audience, and change the outlook on Paris’ legendary institutions.